For the last many weeks, I have been in shock as to all of the ways people are lashing out in hate and all of the ways the earth has been crying out in pain. I have been feeling lost and sick watching it all happen. I’ve been struggling through the heaviness of it all. And yet… there’s also a fire growing within me. A fire of anger, and strength, and determination. A fire that is calling me into action. To align myself with who I truly am. To stand firmly in what I truly believe. To speak up when something is NOT okay. Through all this, I’ve been getting more clear on how inner work is intrinsically connected to society, family dynamics, politics, and all that is happening around us. It is all so tightly interwoven. If I am here to support our Souls’ liberation, then I must also be a part of tearing down the systems that keep us locked up. I’m not exactly sure what that looks like for me yet, especially because I have never been an outspoken person, I like to keep to myself in my home, and I never used to pay much attention to politics. But I’ve been really listening these last few months, especially these last few weeks. And what I do know, is that the more firmly we can stand in our own authenticity and what WE believe in, the more others will be able to as well. Most of us have been taught not to listen to or believe in ourselves, which has made it easy for society to shape us. But no more. We are waking up and we are reclaiming ourselves. In order for change to happen, we all need to be able to stand firm in who we are and what we believe in. If we are to change anything that is happening out there, we must stop dilly dallying and get to work. And by “get to work” I don’t only mean the actions the world needs from us, but I also mean get to playing, get to living, get to BEing – because that’s how we’re going to be more connected to who we truly are so that the actions we do take are more rooted. We’ve been relying on our fearful, analytical, perfectionist, controlling brain too much. We have forgotten our Soul, our true essence; which is full of compassion, of knowing (and not knowing), of love, curiosity, courage, and clarity. I can’t imagine what the world would be like if we were all living from our true essence, using our brain as a helpful tool, rather than letting it rule the show with it’s unconscious patterns that were shaped by society. It’s time to reconnect with the pieces of ourselves that have been hidden away, and find harmony within. I believe art journaling can be the playful way in which we can begin doing that; but yet I see so many struggling against their mind to even get started. So, to support as many people to get moving on this path as I can, and in celebration of my upcoming class Creative Soul Roots, I’ll be sharing a series of Soul-Truths that will help you get clear on why you’ve been feeling stuck, and inspiration to start trusting in your Creative Soul once more. 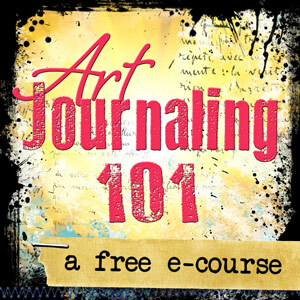 If you’ve been yearning to express yourself freely in an art journal, but still feeling stuck, not good enough, not knowing where to start, or just not able to find joy in the process, sign up for this free mini series which starts Monday, Sept 18th. My hope is that once you let these Soul Truths settle in, you’ll know exactly how to begin and keep moving with joy, courage, and authenticity. Sorry, the Soul Truths series has now ended. Be sure to sign up for my newsletter below to get notified when I run the series again!